This ensemble of printable worksheets helps students gain a stronger foundation in the concepts of regrouping and no regrouping with 3-digit subtraction. The worksheets are available in both column and horizontal formats. To facilitate a convenient practice environment, the subtraction drills are classified into 15 problems (3 minutes), 25 problems (5 minutes) or 50 problems (10 minutes) per page. This spread of worksheets are a great way to keep students engaged. 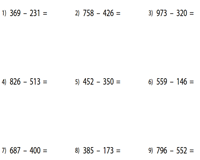 Work out the 3-digit subtraction drills and use the answer key to check your responses. Help the children grasp the skills on 3-digit subtraction involving no regrouping. 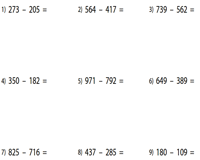 The children may take 3 minutes, 5 minutes and 10 minutes to solve the worksheets with 15, 25 and 50 problems respectively. Students are sure to better their solving skills in 3-digit subtraction with this collection of regrouping (borrowing) worksheets. The problems are arranged in the vertical format. Put a child's subtraction skills to the test with this assembly of 3-digit subtraction drills that involve borrowing. Use the download option to access this entire set of worksheets.